I'm Mariam Martirosyan. I am from Armenia. I study at high school, and next year I will finish school. I love almost all subjects, but mostly math, physics, and other sciences. I often take part in different olympiads and competitions. In my free time I like to read books, learn new things, watch movies or TV, listen to music, or go for walks with my friends. I look forward to applying my mathematical knowledge and learning more about the Mathematica program. The law of moments is popular in physics. 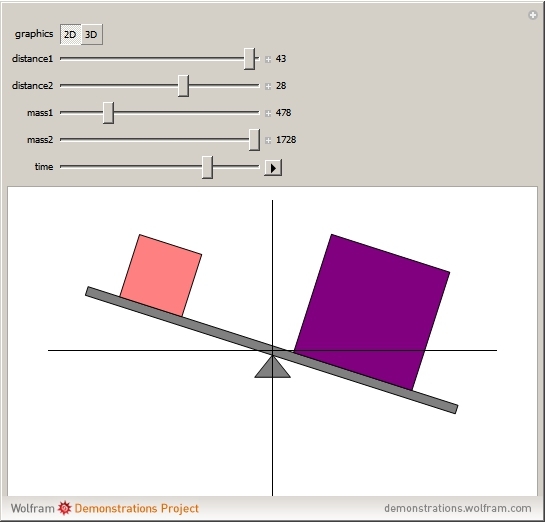 This Demonstration shows a platform with two boxes. This project gives us a chance to see how the lever rotates when the boxes have different masses and distances from the center of the platform.